APRIL Fashion house was founded in 1994 and is known as one of the leading fashion houses in Israel for ladies evening wear design. APRIL is managed by an expert management team headed by the Rahimi brothers. The company had gained a vast amount of experience and has built en enviable reputation in the fashion industry. APRIL designs, makes up and markets unique evening collections. The fashion house’s exclusive styles are targeted towards women of a wide range of ages and to suit all occasions. Since 1994 APRIL developed a chain of branches, which market its exclusive designs to some 100 sales outlets nationwide. The company also set up five flagship stores displaying its designs. In addition, April export her design to several country's in Europe, USA, south Africa and also to Russia and country's around her. APRIL maintains meticulously high standards of quality and professionalism. It currently leads the Israeli fashion industry and invests heavily in the development of many creative and innovative production lines which cater for all seasons. With the help of creative designers and the type of original thinking that that break barriers; APRIL is able to develop new styles that are meticulously sewed on quality fabrics. This has ensured in APRIL’s leadership of quality fashions in the fashion world. 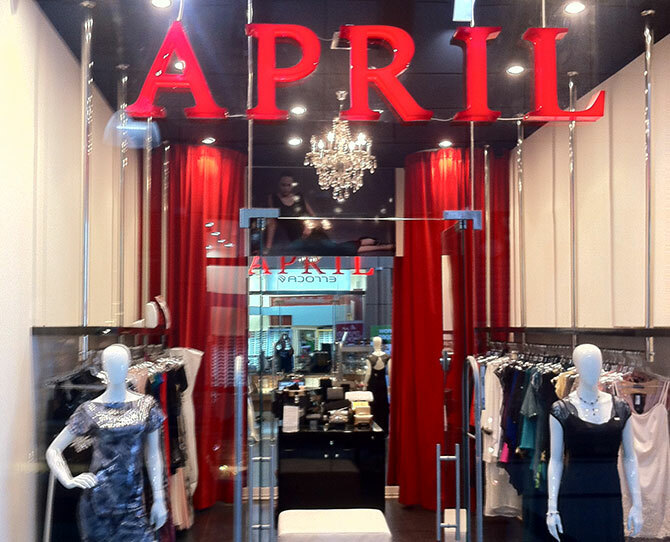 APRIL offers you fabulous ideas and the latest trends with very high standards of finish which leaves a stamp of quality on the direction of Israeli fashions. 5 Tel Giborim st, Tel-Aviv, Israel.